Although these are extremely bland made as-is, a little vinegar and/or hot sauce will kick these up to the Southern notch they greatly deserve. 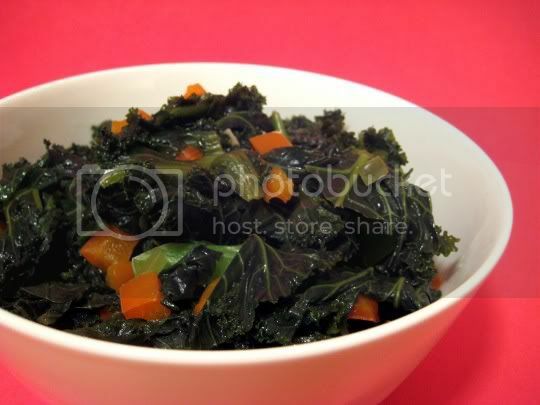 Unlike the usual collard greens, kale and escarole are used in this recipe for an interesting twist, and they prove to be a great substitute or change. Only cooked for about 30 minutes, the texture is perfect: firm with a slight bite and crunch to them, but still soft and stewed enough to be pleasingly edible. The greens are added to sauteed (in olive oil) red bell pepper and jalapeno, so your finished product will have that bell pepper-y aftertaste (if you don't like bell peppers, I'd suggest replacing with onions...which I may actually try next time). There's also garlic in the dish, but it's subtle (so add more!). Make again? I'd try it, but with some recipe adaptations: salt, vinegar, onions, hot sauce...you get the idea.